Sarah Lewis (Andrea Riseborough), a 26-year-old farmer's wife, awakes one morning to find that her husband has disappeared along with all the men in the valley. Assuming they have joined the Resistance, the women of this tiny community pull together, taking on the running of the farms, and wait, desperate for news. A German patrol arrives in the valley, the purpose of its mission a mystery. When a severe winter forces the two groups into co-operation, Sarah begins an acquaintance with the patrol's commanding officer, Albrecht (Tom Wlaschiha). Cut off from the surrounding war, the lines between collaboration, duty, occupation and survival become blurred. Based on the critically acclaimed novel by Owen Sheers, Resistance features fine lead performances from British rising star Andrea Riseborough (Brighton Rock, Made In Dagenham) and Tom Wlaschiha (Enemy At The Gates, Valkyrie, Brideshead Revisited), and co-stars Michael Sheen (Frost/Nixon, The Damned United). 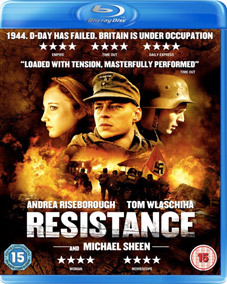 Described by Empire as "A haunting, elegant film about love, loss and what we'll do to survive," Resistance comes to UK DVD on 19th March 2012 from Metrodome at the RRP of £19.99. The extras will include behind-the-scenes featurettes, whose number and content have as yet been unspecified.